108 Marlborough is located on the south side of Marlborough, between Clarendon and Dartmouth, with 106 Marlborough to the east and 110 Marlborough to the west. 108 Marlborough was built ca. 1870 for merchant and banker William Thomas. He and his wife, Cornelia Jane (Bangs) Thomas, lived at 10 Marlborough and he built the house for his daughter, Mary M. (Thomas) Guild, the widow of attorney George Dwight Guild (who had died in 1862 in Brookline). 108 Marlborough was built on the western 22 feet of a 50 foot wide lot that William Thomas purchased from the Commonwealth of Massachusetts on April 9, 1863. On November 9, 1865, he entered into an agreement with Albert F. Sise, owner of the 30 foot lot to the east, running to the corner of Clarendon, specifying that, for the next twenty years, no building of more than eight feet in height could be built in the rear areas of either of their lots (encompassing what would become 270 Clarendon and 104-106-108 Marlborough). The next day, William Thomas sold Albert Sise’s wife, Edith (Ware) Sise, the eastern 10 feet of his lot, and the Sises subsequently built 104 Marlborough on it and the western 9 feet of their lot. On December 16, 1865, William Thomas sold the eastern 22 feet of his remaining 40 foot lot to his son-in-law, attorney Charles Mayo Ellis. Charles and Helen (Thomas) Ellis lived in Roxbury; in about 1872, they moved to 129 Commonwealth. On April 6, 1868, Charles Ellis sold the eastern 18 feet to Rev. Rufus Ellis, who had 106 Marlborough built on it , and on the same day sold the remaining 4 feet, to the west, back to William Thomas, who combined it with his remaining 18 feet and had 108 Marlborough built on it. Click here for an index to the deeds for 108 Marlborough. Mary (Thomas) Guild and her daughter, Edith Thomas Guild, moved to 108 Marlborough from Brookline in about 1871. 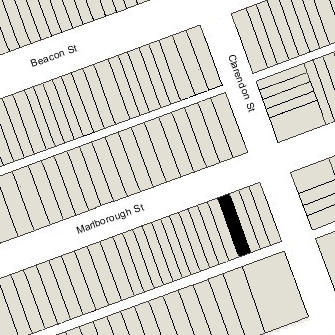 From about 1871 until about 1875, Arthur Lincoln, an attorney, also lived at 108 Marlborough. He previously had lived in Hingham and had moved there once again by 1876. Mary Guild remarried in June of 1876 to Dr. William H. Gorham, a physician. After their marriage, they lived at 108 Marlborough and also maintained a home in Exeter, New Hampshire. During the 1879-1880 and 1880-1881 winter seasons, when the Gorhams probably were in Exeter, 108 Marlborough was the home of Frederic Crowninshield and his wife, Helen (Fairbanks) Crowninshield. Frederic Crowninshield was a noted artist and teacher at the Museum of Fine Arts. By 1882, they had moved to 156 Beacon to live with his step-father and mother, Howard Payson Arnold and Caroline Maria (Welch) Crowninshield Arnold. 108 Marlborough was not listed in the 1882 Blue Book. By the 1882-1883 winter season, the Gorhams were living at 108 Marlborough again. Edith Thomas Guild continued to live at 108 Marlborough until her marriage in June of 1888 to economist Frank William Taussig. After their marriage, they lived in Cambridge, where he was a professor at Harvard. During the 1894-1895 winter season, the Gorhams were in Europe and 108 Marlborough was the home of Henry Sidney Everett and his wife, Katherine Pickman (Fay) Everett. H. Sidney Everett had served as Chief of the US State Department’s Diplomatic Bureau in Washington from 1885 to about 1892. By 1896, they had moved to 321 Dartmouth. Dr. Gorham died in April of 1895 in Florence, Italy. 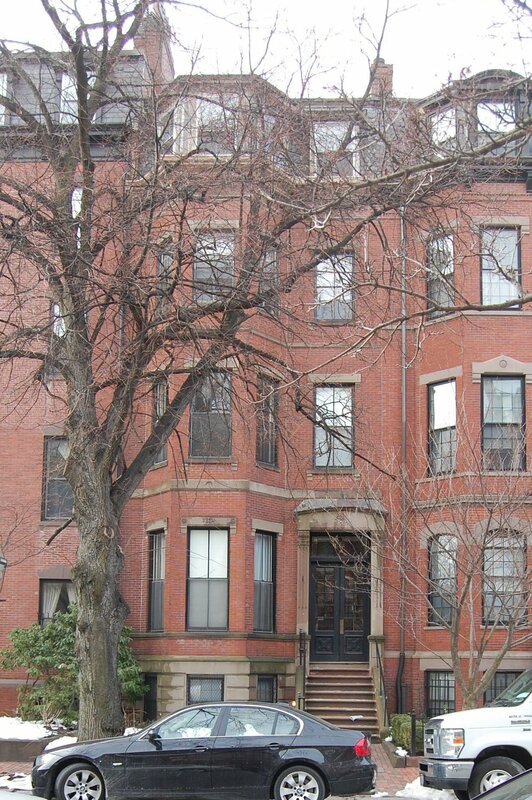 Mary Gorham returned to Boston and continued to live at 108 Marlborough, joined in about 1898 by her first cousin, Miss Mary Thomas, daughter of her uncle, Benjamin Franklin Thomas and his wife, Mary Anne Park. During the 1908-1909 and 1909-1910 winter seasons, Mary Gorham and Mary Thomas were living elsewhere. During the 1908-1909 season, 108 Marlborough was the home of Sarah Kurczine (Lovell) Wesson, the widow of Frank Luther Wesson. Frank Wesson was the son of Daniel Baird Wesson, founder of the Smith & Wesson arms manufacturing company of Springfield. He had been killed in a railroad accident in February of 1887. Living with Mrs. Wesson were their daughter, Cynthia Maria Wesson, and son-in-law and daughter, John Tucker Murray and Mabel (Wesson) Murray. John Tucker Murray was an English scholar and later would become a professor of English literature and head of the English Department at Harvard. By the 1909-1910 season, Sarah and Cynthia Wesson had moved to an apartment at 330 Dartmouth; John and Mabel Murray traveled to England where they were living in 1911. During the 1909-1910 winter season, 104 Marlborough was the home of unmarried sisters, Ellen O. Spooner and Mary Torrey Spooner. They had returned from Europe earlier that year, having previously lived at The Westminster (southeast corner of St. James and Trinity Place), and before that at 381 Commonwealth with their mother, Elizabeth Elliot (Torrey) Spooner, the widow of shipping merchant and textile manufacturer Daniel Nicolson Spooner. Elizabeth Spooner had died in October of 1907. Soon after the 1909-1910 season, Ellen and Mary Spooner traveled to Europe again, returning in the fall of 1912. They lived at the Hotel Somerset during the 1912-1913 winter season, and then moved back to 381 Commonwealth. By the 1910-1911 winter season, Mary Gorham and Mary Thomas were once again living at 104 Marlborough. They continued to live there until Mary Gorham’s death in October of 1915. Mary Thomas moved soon thereafter to The Hemenway (Westland Avenue at Hemenway). On July 13, 1916, 108 Marlborough was purchased from Mary Gorham’s estate by Lucy (Washburn) Putnam, widow of Dr. Charles Pickering Putnam, and their children, Charles Washburn Putnam, Martha Putnam, and Tracy Jackson Putnam. Her sister-in-law, Miss Anna Cabot Putnam, also lived with her. They previously had lived at 63 Marlborough. Lucy Putnam’s brother-in-law and his wife, Dr. James Jackson Putnam and Marian (Cabot) Putnam, lived next door at 106 Marlborough, and her sister-in-law, Elizabeth Cabot Putnam, lived at 104 Marlborough. Martha Putnam married in June of 1922 to Alfred Clarence Redfield, a professor of physiology at Harvard and later a noted oceanographer. After their marriage, they lived in Cambridge. Charles Putnam was a lawyer in Boston. After serving in World War I, he became a trainer with the Federal Board for Vocational Education, working with disabled veterans. He married in January of 1923 to Imogene Phipps Hogle, who was the resident director of the South End House, a settlement house. After their marriage, they lived at 108 Marlborough with his mother, brother, and aunt. Tracy Jackson Putnam, a neurologist and later professor of neurology at Harvard and Columbia, married in June of 1924 to Irmarita Kellers, also a physician. After their marriage, they lived at 108 Marlborough. Anna Cabot Putnam died in August of 1924. In about 1925, Charles and Imogene Putnam moved to Ohio. 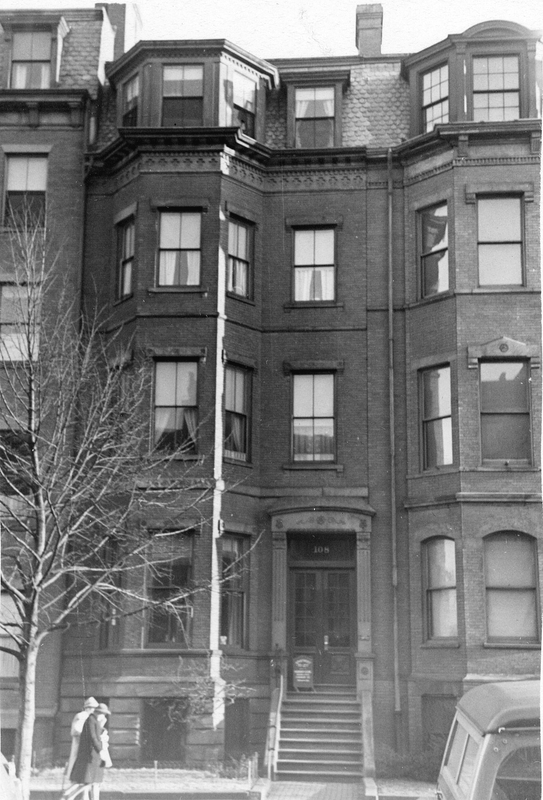 Lucy Putnam and Tracy and Irmarita Putnam continued to live at 108 Marlborough during the 1925-1926 winter season but moved soon thereafter to Brookline. On May 18, 1926, 108 Marlborough was purchased from Lucy Putnam by Ellen Sears (Curtis) Minot, the wife of bond broker Henry Whitney Minot. They had lived at 323 Beacon during the 1925-1926 winter season. They continued to live at 108 Marlborough in 1929, but had moved to Brookline by 1930. On July 29, 1929, 108 Marlborough was acquired from Ellen Minot by cotton broker and wholesale dry goods merchant Walter Cabot Baylies. He and his wife, Charlotte (Upham) Baylies, lived at 5 Commonwealth and in Taunton. On September 30, 1929, he transferred the property to the Boston Safe Deposit and Trust Company. It appears that Walter Baylies purchased 108 Marlborough on behalf of Emmanuel Church and by the 1929-1930 winter season, it was the home of the church’s rector, Rev. Benjamin Martin Washburn and his wife, Henrietta Tracy (de Selding) Washburn. They had moved from Kansas City, Missouri, where he had been rector of St. Paul’s Episcopal Church. They continued to live at 108 Marlborough during the 1931-1932 winter season, but moved soon thereafter to New Jersey, where he became Bishop Coadjutor of the Diocese of Newark. 108 Marlborough was not listed in the 1933 Blue Book. By the 1933-1934 winter season, 108 Marlborough had become the home Rev. Washburn’s successor as rector of Emmanuel Church, Rev. Phillips Endecott Osgood, and his wife, Marion Curtis (Stone) Osgood. They continued to live there until 1937, when they moved to 116 Commonwealth. On August 10, 1937, 108 Marlborough was acquired from the Boston Safe Deposit and Trust Company by Dr. Mark Wyman Richardson, a physician. He and his wife, Josephine (Lord) Richardson, lived in Newton. In November of 1937, he applied for (and subsequently received) permission to convert the house into seven apartments. He and his wife moved to one of the apartments. The property changed hands and on December 7, 1948, was acquired by Dr. Rose (Wexler) Winston, a physician. She and her husband, Dr. Murray R. Winston, also a physician, lived in one of the apartments. They previously had lived in Lexington. They continued to live at 108 Marlborough until 1958, when they moved to 133 Commonwealth. On August 9, 1960, 108 Marlborough was acquired from Rose Winston by William Christo and his wife, Martha (Stephenson) Christo. On November 27, 2007, they transferred the property to William Christo as trustee of The William Christo Trust, and to Martha Christo, as trustee of the Martha S. Christo Trust. William Christo died in June of 2010. 108 Marlborough remained an apartment building in 2016.